In order to gain a more detailed understanding of the daily realities of online harassment, the 41% of adults who have been targeted online were asked a series of questions about their most recent experience.3 These questions cover the venues in which their online harassment took place, its perpetrators, the actions people took in response (if any), whether people sought support from those around them and how upsetting they found the experience. By a substantial margin, social media stands out as the most common venue in which online harassment takes place. When asked where their most recent experience with online harassment occurred,4 nearly six-in-ten targets of harassment (58%) say it took place on social media. Similarly, a majority cited social media as the scene of their most recent harassment in Pew Research Center’s 2014 survey on online harassment. 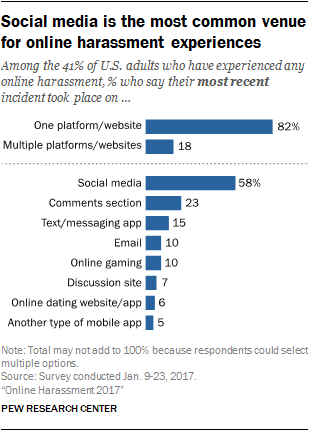 Along with social media, 23% of those who have been harassed online say their most recent incident took place in the comments section of a website, 15% say it involved text or messaging apps, and 10% each say it took place over email or on an online gaming site. Other environments – such as discussion forums and dating websites – are cited by fewer than 10% of those who have been harassed. There are relatively few demographic differences related to where harassment takes place, with gaming being a major exception. Men who have experienced harassment are nearly four times as likely as women to cite gaming as the scene of their most recent incident (15% vs. 4%). Similarly, young adults are more likely than older adults to say they have faced online harassment while gaming. Some 18% of those ages 18 to 29 cited gaming as a platform where they were harassed most recently, compared with 5% of those ages 30 and older. Younger men are especially likely to say that their most recent harassment experience occurred in an online gaming space: 31% of 18- to 29-year-old men with harassment experiences say this, compared with just 4% of women in the same age group. The common practice of maintaining multiple profiles or accounts can leave users exposed to harassing behavior across a variety of online spaces, and around one-in-five harassment victims (18%) say their most recent experience happened across multiple sites or platforms. However, the vast majority of those who have experienced online harassment (82%) say their most recent experience occurred on one specific site or platform. Many of those who experience online harassment are uncertain of who is perpetrating it: 34% say that the source of their harassment was a stranger, while another 31% say they do not know the real identity of the person(s) harassing them. 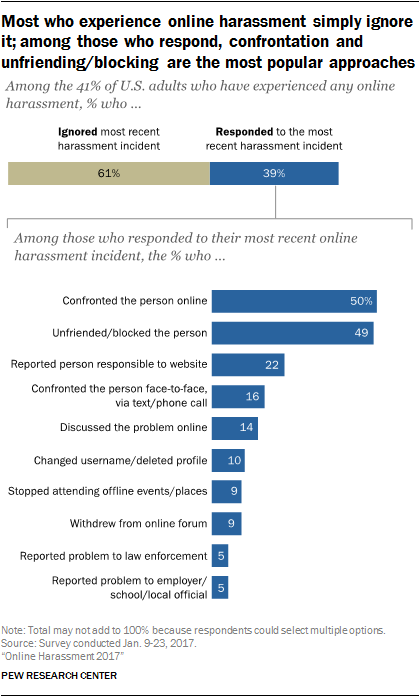 Taken together, 54% of online harassment targets say the person behind their most recent incident fell into one of these two categories, a figure that is statistically unchanged from the 50% who said the same in 2014. At the same time, many people report that their harassers are known to them – in some cases, very well known. Roughly one-quarter of those who have been harassed (26%) say an acquaintance was responsible for their most recent incident. Meanwhile, 18% of those who have been harassed say their most recent incident involved a friend, while 11% say it involved a family member. Fewer than one-in-ten say their most recent experience involved a former romantic partner (7%) or a co-worker (5%). And just as harassment may take place across multiple sites, it can also be at the hands of multiple perpetrators. 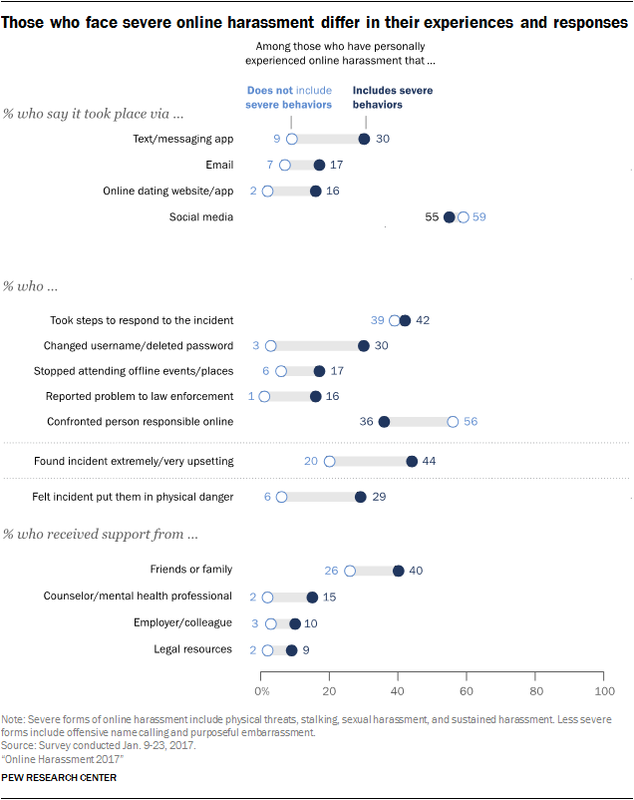 Roughly one-third of those who have been harassed online (32%) say multiple people were responsible for their most recent incident, while almost half (49%) say just one individual was responsible. Another 18% are not sure if their most recent incident was perpetrated by one person or multiple people. As was the case in 2014, people often try to ignore online harassment when it occurs. Fully 61% of those who have experienced online harassment say they ignored their most recent incident, while 39% chose to take some sort of step in response. Among those who did respond to their most recent online harassment incident,5 half (50%) chose to confront the person responsible online while 49% unfriended or blocked that person. Another 22% reported the person responsible to a website or online service, and 14% discussed the problem online to draw support for themselves. Other online steps – such as changing a username, deleting a profile or withdrawing from an online forum – were less common. Others relied on established relationships to address the problem. Some 16% of those who responded to their harassment confronted the person face to face, via text message, or by phone. This approach was especially common in instances where the target knew their perpetrator, such as when the person or people involved were friends, family, ex-romantic partners or acquaintances. Responses involving some sort of offline location or intervention – like refraining from attending offline events or places, or reporting the problem to an authority figure – were taken by a relatively small share of those who responded to their most recent harassment incident. Regardless of whether people chose to ignore or respond to their harassment, most express satisfaction with the result. Some 74% of those who took action in response to their most recent harassment incident said it was effective at making the situation better – as did 69% of those who chose to ignore the behavior. However, there is some evidence that ignoring online harassment has perhaps gotten less effective over time: In 2014, 82% of those who chose to ignore their most recent incident said that it made the situation better. Beyond steps harassment targets can take individually to address or mitigate harassment online, a number of people sought personal help or support during their most recent experience. Most commonly, this involved turning to friends and family: 29% of those who have experienced harassment online say they received help or support from friends or family during their most recent incident. Women are more likely than men to have sought out or received this kind of support during their most recent experience (34% vs. 25%). Along with friends and family, 17% of those who have experienced harassment online say they received support from other people online during their most recent incident. Smaller shares sought help from a counselor or mental health professional (5%), an employer or colleague (4%) or legal resources (3%). That said, the largest share of harassment targets go it alone: 56% either did not seek or did not receive support from any of these sources during their most recent incident. Men were more likely than women to say they did not seek or receive any of these types of support (60% vs. 51% of women). Just as online harassment exists along a spectrum of severity, those who have encountered some form of harassment feel its impact in various ways. At one end, about half of those who have experienced online harassment say that their most recent incident was either “a little” (26%) or “not at all” (23%) upsetting. Still, others find these experiences deeply troubling: 25% say their most recent harassment incident was either “extremely” (12%) or “very” (13%) upsetting. Women are especially likely to be deeply impacted by their harassment experiences. Among women who have been harassed, 35% found their most recent experience either “extremely” or “very” upsetting, more than double the share of men who said the same (16%). And for a minority, online harassment can even threaten their personal safety. 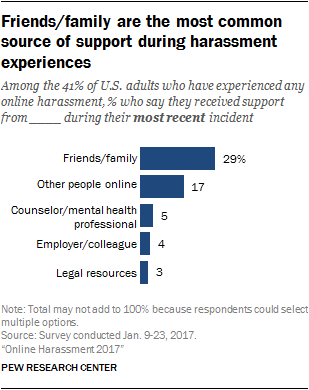 Among those who have experienced harassment online, 12% say they felt a threat of physical danger for themselves or people close to them during their most recent harassment incident. To capture the many forms online harassment can take – from casual name-calling to more targeted campaigns – this report uses a broad definition of harassment. And while defining and categorizing harassment in this way allows for a holistic analysis, the data suggest that what constitutes “online harassment” can be highly subjective to those who experience it. To that end, respondents who met the definition of online harassment used in this report were also asked if they themselves considered their most recent experience to be online harassment. Some 36% say they do in fact consider their experience to be online harassment. At the same time, 37% do not consider their most recent experience to be online harassment and another 27% are not sure if they consider it harassment or not. Women are more likely than men to describe their most recent experience as “online harassment” (42% vs. 31%). But in general, the responses to this question highlight the subjective nature of online harassment. For instance, 28% of those whose most recent incident meets this report’s definition of “severe” harassment do not consider their experience to be online harassment (another 21% say they weren’t sure). 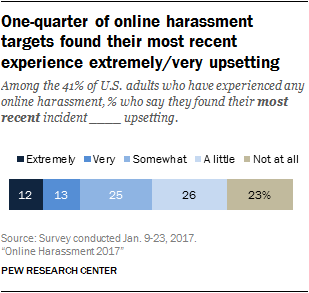 Meanwhile, 32% of those who have only encountered “mild” behaviors such as name-calling or embarrassment do consider their most recent experience to be online harassment. Across almost every dimension of this survey, those whose most recent incident with online harassment involved severe behaviors differ in their responses and reactions to the experience, compared with those whose most recent incident involved less severe behaviors such as offensive name-calling and efforts to embarrass them. First, these groups differ in terms of where their online harassment took place. Social media is the most common scene of online harassment regardless of the severity of one’s experience, but those with severe experiences are significantly more likely to say their most recent incident took place via a phone or messaging app (30% vs. 9%), personal email (17% vs. 7%) or an online dating site (16% vs. 2%). They are also more likely to say that their harassment spanned multiple online venues (27% vs. 14%). Some 42% of those whose most recent incident included severe forms of harassment took steps to respond to the behavior, similar to the 39% of those whose most recent experience involved less severe behaviors. But there is a good deal of variation in the steps that each group took in response. Those whose most recent incident involved severe forms of harassment are more likely to say they changed their username or deleted their profile, stopped attending offline venues or reported the incident to law enforcement. On the other hand, those responding to less severe forms of harassment were much more likely to confront their harasser directly online. Those whose most recent online harassment experience involved severe behaviors are also more likely to say they received support from a number of sources, such as friends or family, a counselor or other mental health professional, an employer or colleague, or legal resources. This group is also much more likely to say they were deeply unsettled by the experience: 44% say they found their most recent incident to be “extremely” (28%) or “very” (17%) upsetting. Similarly, 29% of those whose most recent incident involved severe behaviors say they felt they or someone close to them were in physical danger during the experience, more than four times the proportion of those whose harassment did not include severe behaviors (6%).